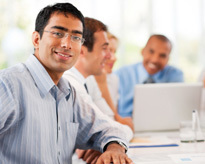 Expertise in new product design and developing technologies. 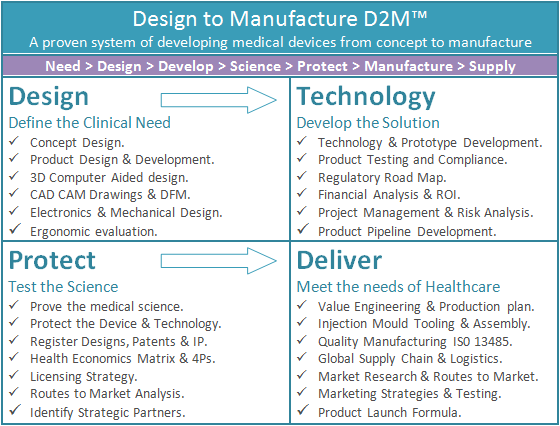 Design to ManufactureD2M™ is our successful system of new product development from concept design to final manufacture helping guarantee success in developing innovative new medical devices & healthcare products. The system drives the design & development process connecting clinical needs with improving patient care resulting in the design & manufacture of value engineered medical devices, meeting the needs of patients and healthcare providers. For a confidential, no obligation discussion so we can understand your needs, what you’re looking for, how we can help and the advantages of using our skills and resources. Medical Devices & Healthcare Are you looking for expertise in Design, Development, Marketing or Manufacturing of Health & Medical devices? Pharmaceutical Drug Delivery Are you a Pharmaceutical company looking to outsource Design, Pipeline Development or Contract Manufacturing. Sourcing Medical Devices Are you looking to source Health & Medical Devices from Far East ISO13485 Approved Suppliers. Oral Care Technologies Are you looking for Innovative Oral Care Product Solutions or expertise in Developing Health & Personal Care. Do you have an idea? Are you a Healthcare Professional, NHS, Company or Academic with an idea targeting a clinical need. © Copyright. ViVO Smart Medical Devices Ltd.